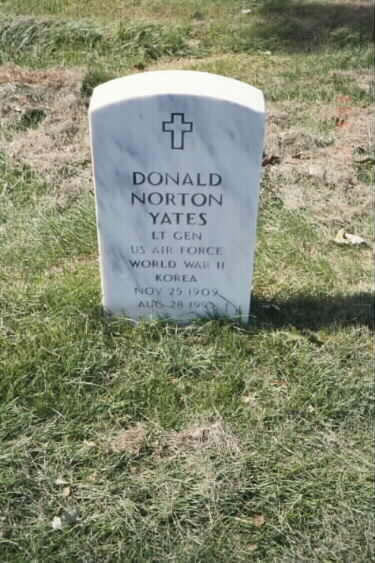 Donald Norton Yates was born in Bangor, Maine, in 1909. He graduated from Bangor High School in 1927, and attended the U.S. Military Academy, graduating in 1931. He was commissioned a second lieutenant in the Cavalry. Second Lieutnant Yates' first assignment was that of student officer at the Air Corps Flying School at Kelly Field, Texas. He received his pilots wings the following year, and now is rated a command pilot. In December 1932, he went to Luke Field, Hawaii, for duty with the 23rd Bomb Squadron. He was transferred from the Cavalry to the Army Air Corps on Jan. 25, 1933. In November 1935 First Lieutenant Yates was assigned to Brooks Field, Texas, serving in various assignments until June 1938. At that time he became a graduate student at the California Institute of Technology, and a year later received a master of science degree in meteorology. He then was assigned to the Third Weather Squadron at Barksdale Field, Louisiana, as weather officer. Captain Yates became executive officer of the Sixth Air Base Group at Barksdale in March 1941, and served subsequently as group commander and post operations officer. He became assistant chief of the weather section in the operations division of the Office, Chief of Air Corps, in December 1941, and in March of the following year was appointed deputy director of weather at Army Air Force headquarters. From May to December 1942 Lieutenant Colonel Yates was in the U.S.S.R. as a member of a military mission, coordinating weather matters. He received the Distinguished Service Medal for his part in this mission and the Air Medal for operations which included a flight from Washington D.C. to Yakutsk, Siberia, over South America, Africa, the Middle East and Russia. In February 1944 Colonel Yates became director of weather service for the U.S. Strategic Air Force in Europe, in addition, serving on General Eisenhower's staff. For his participation in the selection of June 6 as D-Day for the Normandy invasion, he was decorated by three governments. The citation accompanying the U.S. Army Legion of Merit stated that "through Colonel Yates' good judgment, skill and sound leadership, reconciliation of the differences in forecasting methods were effected, resulting in the development of a procedure capable of utilizing the talents and facilities of both nations and all services in a unified manner. The value of Colonel Yates' advice has since been proven as the day selected for the continental assault was probably the only day during the month of June on which the operation could have been launched." For this he received the Degree of Chevalier in the National Order of the Legion of Honor of France. 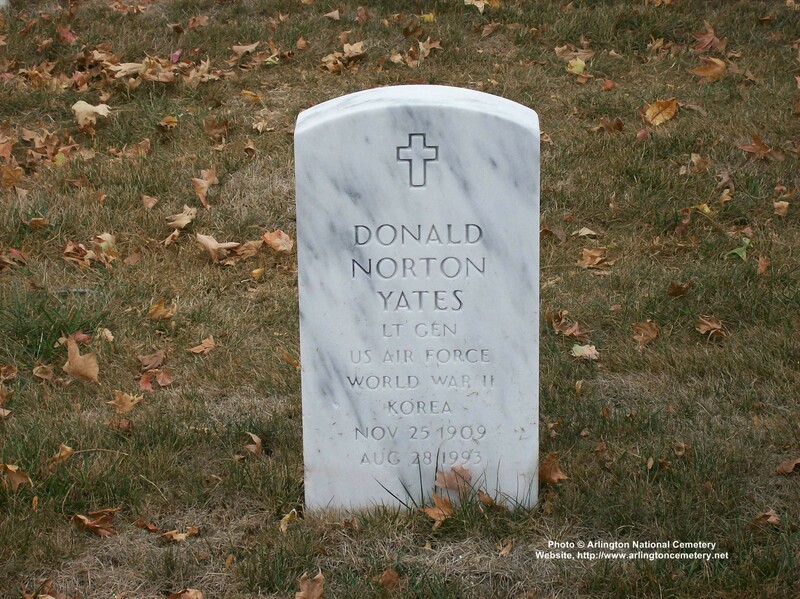 Upon his return to the United States in January 1945, Colonel Yates was made chief of the weather division which later was merged with the Weather Wing to form the Air Weather Service, which he commanded at Andrews Air Force Base, Maryland, until 1950. During this period he was promoted to the rank of brigadier general on February 5, 1947, and transferred to the U.S. Air Force on September 26, 1947. On March 17, 1947, he flew the first scheduled weather reconnaissance mission over the North Pole. In July 1950, Brigadier General Yates was appointed assistant deputy chief of staff for development at Headquarters U.S. Air Force, and the following April he became director of research and development with the headquarters. He was promoted to the rank of Major General on February 2, 1952. Major General Yates was commander of the Air Force Missile Test Center, Patrick Air Force Base, Florida, from July 31, 1954 to May 4, 1960. During this tour he was awarded the Navy Legion of Merit on May 22, 1958 by Secretary of the Navy Thomas S. Gates Jr. The citation praised his outstanding services in connection with the Navy Project Vanguard and the Navy Ballistic Missile Program Polaris. It stated that "he repeatedly authorized unusual courses of action in order to expedite the projects." In addition, on August 24, 1960, Secretary of the Army Wilber M. Brucker presented him with the Army Legion of Merit, which stated, "his broad knowledge of the missile and space testing programs of each member service was instrumental in shaping top level policy and crucial decisions which progressively advanced the successful development of the Redstone, Jupiter and Pershing missiles, The Explorer satellites and other space vehicles." In addition, General Yates has been awarded the Croix de Guerre with Palm "for exceptional war services rendered in the course of operations for the liberation of France", Honorary Officer in the Most Excellent Order of the British Empire, a decoration as Grande Oficial de Ordem Militar de Cristo of Portugal. On May 4, 1960 General Yates was promoted to the rank of Lieutenant General and appointed deputy director of defense research & engineering (Ranges and Space Ground Support), Office of the Secretary of Defense,Washington. D.C.
General Yates is a member and former president of the American Meteorological Society, a member of the Institute of Aeronautical Sciences, and a Fellow of the American Rocket Society.